IN the wake of the Virginia Tech massacre, college and university safety systems and procedures are undergoing extensive re-evaluation, with reliable and effective emergency mass notification being the main emphasis. Dr. Lei Wei, a researcher and professor in the School of Electrical Engineering and Computer Science at the University of Central Florida, reported that while most K-12 schools have intercom or public announcement systems in place to alert students and faculty of emergency situations, and notify them of specific action to take, most college and university campuses have no equivalent systems. Unfortunately, because these environments hold a high concentration of young people and valuable infrastructure protected by minimal security, they are especially vulnerable to crises ranging from natural disasters—as underscored by Hurricane Katrina—to emergency events such as terrorist attacks and gun violence. Recent events have made it especially clear that these environments require systems and procedures to quickly relay critical information in emergency situation to all buildings, classrooms and offices to alert students, faculty and staff. One major point of contention surrounding this issue is the fact that the success of mass notification systems and procedures is contingent upon security officials’ ability to reconcile the dynamic character of the campus environment with alert and mass notification systems. To successfully plan and implement an emergency notification system, security officials must first determine where campus communication weaknesses lay and, from there, determine what type of systems or combination of systems have the best ability to overcome the specific weaknesses. A recent study headed by Wei and a team of researchers at the University of Central Florida, funded in part by the Department of Homeland Security, offers some conclusive insight into the characteristics of a good emergency mass notification system, the main communication weaknesses posed by general attributes of campus environments and the best solutions for overcoming these weaknesses to effectively plan and implement a successful mass notification system. Essentially, the findings suggest that campus security officials should focus on assembling the best possible combinations of alert and notification equipment that will ultimately result in systems capable of delivering constant and varying messages to all areas on a campus during an emergency. The study was conducted with the objectives of developing best practices on how to communicate within individual college and university campuses, and to recommend the best systems to install in campus environments to provide alert and notifications in times of crises. • The system must be able to reach and inform a large population of students and teachers across the campus and surrounding areas within a small interval of time. This requires the system to reach individuals located indoors and outdoors, and in remote as well as local facilities. • The system must be able to deliver site-specific information to people in different areas, requiring the system to be able to produce multiple and changing messages in multiple locations, constantly throughout the emergency. • The system must provide backup power and phone capabilities in the event of a power outage or downed telephone service. The system must be able to provide basic communication under extreme conditions and be equipped with battery backup or automatic wireless capabilities. Of the campus notification systems already in place, the study found that most of them do not meet all three of the key requirements. Some only partially satisfy the different criteria. This was due in part to a few general characteristics of campus environments and behaviors that impair the ability of notification systems and render a single design for an all-hazard system difficult. The first detrimental characteristic is the variety of buildings and structures usually found in higher education. Most college and university campus grounds are formed by numerous buildings that vary in infrastructure and operation, and are based on many different design codes. With these variations, some buildings are shielded from wireless and radio signals, preventing even the use of FM radios in an emergency situation. In addition to the variety of building infrastructures, campuses usually maintain a broad range of facilities equipped with different and independent safety systems, preventing one of the most essential qualities of a campus communication system—cohesion. In order to deliver an alert to as many people as quickly as possible, a campus-wide communication network has to be in place and functional. Another obstacle in the way of a cohesive notification system is the number of campuses of a single institution and the variance among them. Building types and campus settings vary significantly from one campus to another, and the distances between the different campuses pose yet another problem. Aside from the structural attributes of the college campuses, the study found that the behavior of the individuals inside of these environments also must be considered when planning a campus notification system. 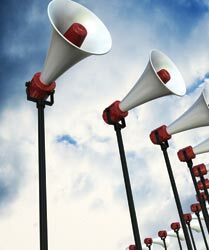 For example, one of the study’s surveys found that 95 percent of survey respondents do not know the difference in meaning between alternating steady siren and wail siren tones, indicating that siren systems—one of the most commonly used alert systems—may be good for a general alert, but are ineffective in carrying a precise message. The survey also found that 50 percent of students will not immediately pick up a ringing phone, thus implicating another widely used alert method, reverse 911 service. Finding one piece of telecommunications equipment capable of meeting all three of the requirements for an effective notification system, particularly on a limited budget, is extremely difficult. The University of Central Florida study concludes that the best solution lies in putting different types of existing equipment together to achieve the desired result—namely, a cohesive system that informs as many people as quickly as possible, constantly delivers relevant messages to different areas and remains functional in the event of power and phoneline failure. The best possible mass notification systems combine, among other feature, the use of siren technology, surveillance systems and broadcast announcements. Sirens can effectively alert people within hearing distance that a crisis or emergency situation may exist and inform the public to implement some pre-determined action, such as tuning into the news for information. Where the siren is limited in disseminating specific information, a combined broadcast system compensates, especially if it accommodates both live and automated broadcasts. The surveillance system is one of the most effective tools used to reduce crime rates on college campuses. It also is an important tool for identifying individuals engaged in suspicious activities. With an integrated surveillance system, campus security officials can check for suspicious activities and monitor reactions on a campus during a crisis. Campus security has already moved towards advances in communications equipment, the industry is moving closer toward all-in-one solutions that meet all three of the outlined criteria for campus notification systems. With the strides being made through pervasive and evolving integration trends, finding one piece of telecommunications equipment to meet the entire range of campus communication needs will eventually be a reality. The latest class of wide-area emergency broadcast systems is a perfect example of this progress and currently represents the best possible solution for mass notification in campus environments. These systems are a combination of emergency phone tower and warning system, adapted specifically towards the communication needs of the campus environment with attention to the limitations of these environments outlined in the study. Like traditional phone towers, the wide-area broadcast system features a blue light/strobe and emergency phone that provides two-way emergency communication for personal emergencies and/or service calls. Unlike traditional phone towers, the new systems feature powerful re-entrant speakers capable of broadcasting live messages, pre-recorded automated messages and siren tones. While these systems provide a powerful broadcast, they are still far more focused than traditional warning systems and can be strategically placed throughout campuses to provide localized broadcast and deliver relevant information to different areas, all from a single command station. The systems also integrate with PTZ cameras for wide-area surveillance. Through this single system, campus security officials can receive emergency phone calls, maintain both visual and auditory communication with the tower location, transmit emergency messages via phone line or wirelessly to towers individually, in selected groups or in all-call for larger area coverage. They can essentially notify an entire campus of an emergency situation and procedures within a matter of seconds. A reliable communications system is an essential component in easing the potential impact of a crisis, and an effective, reliable emergency mass notification system should be the bedrock of every campus communication system. Planning for the proper configuration of such a system has become more involved. Officials must provide not only for the growth in both the size and variety of potential threats, but also for the weaknesses resulting from the campuses themselves. Therefore, it is necessary and essential for each institution to undertake a comprehensive survey and study of its own grounds and community to determine its best course and combinations for mass notification and procedures. This article originally appeared in the September 2007 issue of Security Today.